Angela Owen�s years as MPRO�s music director coincided with the rise of what has come to be known as the historically informed performance movement. This movement called for early music to be played on surviving historical instruments or faithful copies along with tuning systems, pitch standards, playing techniques and expressive devices appropriate to the period. The movement began in Europe around 1970 and quickly spread to the United States, particularly the San Francisco Bay Area. This was not surprising since performances of early music here steadily increased during the 1960s and Stanford University had instituted a graduate program in early music performance practice during the latter part of that decade. Early in the 1970s, performers appeared in the Bay Area who were proponents of this movement along with craftsmen who began producing instruments according to the standards of historic prototypes. These included talented amateurs, students and upcoming professionals. Their growing numbers led to the formation of organizations, ensembles and educational programs in the Bay Area devoted to early music and historically informed performance, including the San Francisco Early Music Society (1975), the Palo Alto Telemann Society (1977), the SFEMS summer workshops (1978), Philharmonia Baroque (1981), the Center for Computer Assisted Research in the Humanities (1984) and MusicSources (1986) as well as three new chapters of the American Recorder Society in or around the nine Bay Area counties. These organizations, ensembles and educational programs began to serve as a support system for local early music activities and led to an increasing number of professional musicians and instrument makers in the region who were devoted to historically informed performance. While some of these were local residents, others came from various parts of the United States and Europe, many of whom settled here. As a result, by the mid-1980s the Bay Area had become one of the world�s leading early music centers. From the 1970s through the mid-1980s, the relationship between the historically informed performance movement in the Bay Area and MPRO can best be described as symbiotic. Since the recorder was one of the signature instruments of this movement, it not only secured a place for the recorder in the local early music environment but also sustained an interest in recorder playing. This benefited MPRO by insuring a ready pool of recorder players from which members could be drawn, and the orchestra, in turn, provided those interested in the recorder the opportunity to play in a large ensemble as well as join smaller groups attached to MPRO. Many of those who were members of the orchestra at this time were also involved with other local early music organizations and educational programs. This increased their interest in early music and the recorder by broadening their scope of experience, and this experience, in turn, filtered into MPRO through their playing and understanding of the music that the orchestra presented at its meetings and concerts. As the number of local professional musicians who were part of the informed performance movement increased, MPRO made use of their expertise by engaging them as directors for meetings and workshops. This not only provided the members of the orchestra with exceptional instruction but also helped support the community of early music professionals residing in the Bay Area. Meanwhile, the recorder orchestra movement was taking place. When Angela Owen took over as MPRO�s music director, there were only three recorder orchestras throughout the world, one of which was MPRO. By the time she stepped down from this position in 1987, the number had increased to nine. While there is no evidence that MPRO had any influence on the growing number of recorder orchestras, it can be said that MPRO was in the forefront of this movement and that when a majority of recorder orchestras were being formed during this period MPRO was already a well-established and successful organization. 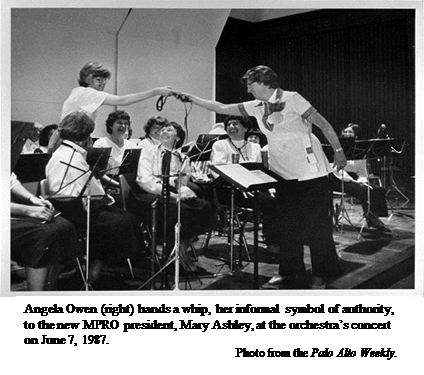 As MPRO�s music director, Angela Owen promoted the formation of small ensembles from the orchestra�s membership and encouraged these groups to perform at MPRO meetings and concerts as well as for local organizations and events. There were two positions on the orchestra�s board that assisted her with this endeavor, the Consort Coordinator, who helped members find an ensemble to join or form a new one with others, and the Librarian, who maintained the orchestra�s collection of music that ensembles could borrow and use to increase their repertoire. Angela also kept information regarding each ensemble on file so that she could suggest appropriate performing opportunities for any of these groups. Small ensembles were also asked to submit articles to the orchestra�s newsletter in order to introduce themselves and report on their activities. Angela believed that playing in a small ensemble maintained and improved technique, particularly during the summer when the orchestra did not meet. She also believed that the social component was an essential part of the recorder orchestra experience. Besides periodic MPRO picnics, Angela arranged for a special meeting each December to which the family and friends of the membership were invited, refreshments were served, small ensembles performed and holiday songs were sung. This gave the orchestra�s members an opportunity to interact with one another in a more intimate situation than a rehearsal or concert. The importance of Angela Owen�s role in the history of MPRO cannot be overstated. Not only did she step in at a crucial time when the orchestra needed a new director and leadership in order to survive, but she also brought with her the musical expertise and organizational skills that made MPRO a sustainable and thriving entity. By the time she retired from her duties MPRO had become a local institution. Listed below is the music for the orchestra's next three meetings. Please note that there will be sectional seating for the Gabrieli Canzon Septimi Toni, with those in Coro Primo sitting on the right as they face the conductor and those in Coro Secundo on the left. Please observe this seating arrangement when you choose your place at the beginning of the meetings on March 20 and April 10. Please note as well that bass viola da gamba, dulcien and sopranino recorder will be needed at all three meetings, krummhorns on March 27 and great bass and contrabass recorders on March 20 and April 10. New MPRO member Diana Gelblum was born and raised in Israel, in a kibbutz from age 9. She served her 20 months in the military at age 18, and returned to the kibbutz to serve as a house mother for another year. Afterwards she worked as a bookkeeper, and met her American-born husband. Their two kids were born in Israel, but they had Silicon Valley connections and the family moved here when the kids were 5 and 8. Now, 25 years later, she's gotten an accounting degree from SJSU, and the kids are grown and married and both are now out of the area, so Diana has more time to pursue what she enjoys, although she's still working full time as an accountant. With all her classmates in the kibbutz, Diana was introduced to soprano recorder in 4th grade. Apparently she excelled, because she was soon invited to join an advanced group, and started playing alto. In 7th and 8th grade, she concentrated on piano. Since then she has played recorder for pleasure at every opportunity, while also indulging in singing in Hebrew and painting.